Part 3 brings us the wood. First off, the solid teak legs. All pretty self explanatory! From the top left we have a comparison between a sanded teak leg to one with the original finish which I’ll use a guide for when it comes ‘colour matching’. Working clockwise we then have all 4 legs sanded. Due to only wanting to remove the original finish I didn’t have to go to harsh with the sandpaper. 240 grit was plenty enough to remove it, and then finish with a 400 grit which gave a great, super smooth finish. Bottom left shows all 4 legs in my jig to apply the danish oil finish. This was after 1 coat, notice the matt finish, and how it will change to a higher gloss/sheen when more coats are applied. Also of note are the 2 distinctive shades of colour between the legs, with the longer legs (front) being darker. 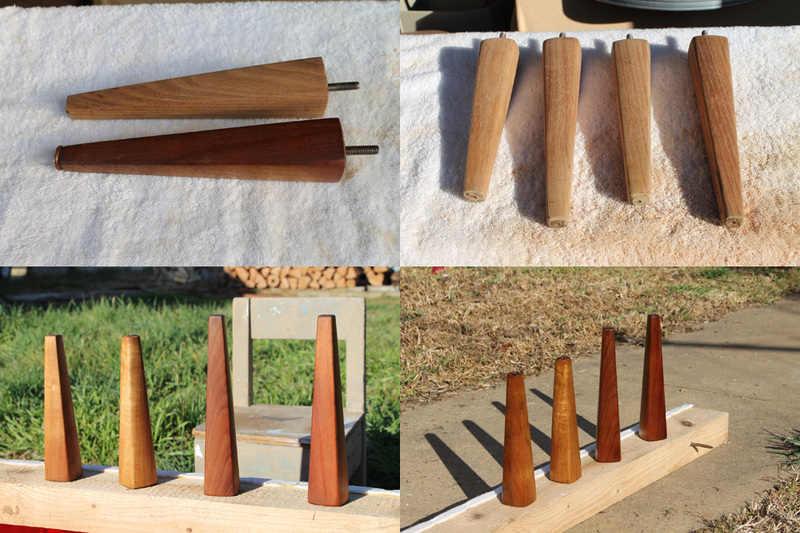 Bottom right shows the completed legs with 4 coats of Danish Oil applied. Very happy with the end result! With the legs now done and dusted, my attention turned indoors, and to the well worn hand rests. To remove what was left of the original shellac finish I used a cabinet style scraper. What you see above is the completed works. 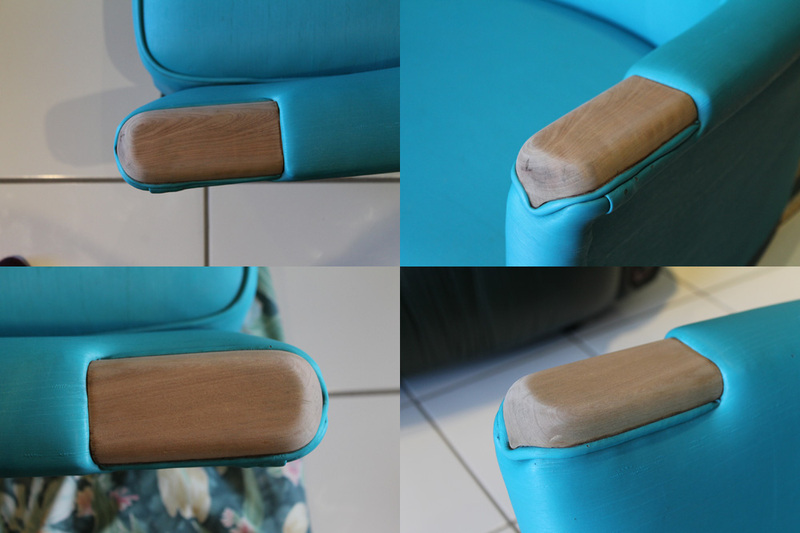 With a steady hand and some 240 grit sandpaper I got to work being ever so careful to avoid the vinyl upholstery. An hour later and a few sheets less of sandpaper and I was done. 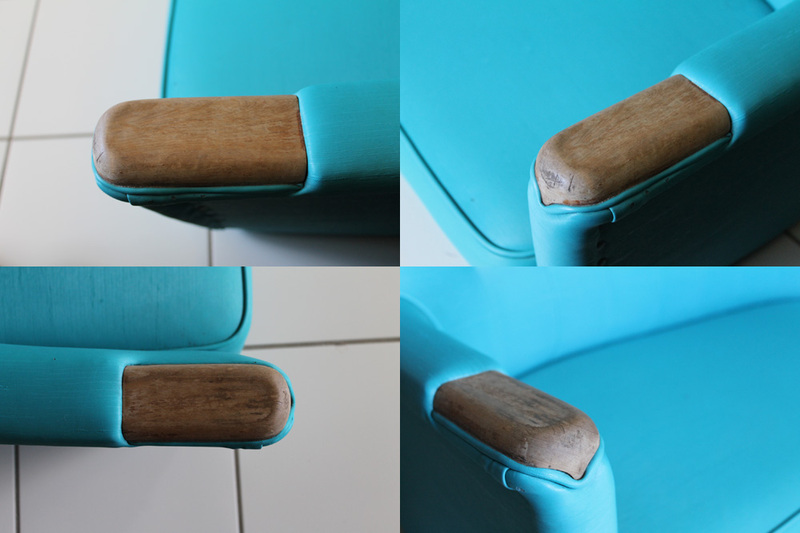 I was super impressed with the grain on the left side hand rest. I couldn’t see it before through the shellac, but it’s looking like there’s a bit of fiddleback in there. Will be great to see how it shows up under the Danish Oil! A quick hit with some 400 grit to wrap things up and we’re just about ready to apply the new finish.